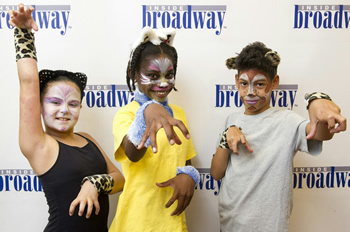 Kids at Inside Broadway’s Summer Stock Jr. produced a “Cats” spinoff this year. August – that sultry summer month saturated with dog days of sweltering heat. Vacations come to an end as the start of the school year looms large on the horizon. However, for 15 children who attended Inside Broadway’s Summer Stock Jr. musical theater camp hosted by Local 802, August was nothing but cool. Similar to last year, the camp ran for two consecutive weeks, rehearsing and practicing in 802’s Club Room. A big round of applause is due to 802’s officers and Executive Board for their generous donation of the room for this important summer program. Without it, Summer Stock Jr. could not happen. Inside Broadway was originally designed as a program to give out free Broadway tickets to NYC’s under-served public school students. “Cats” happened to be the first musical to participate in that program. During the show’s entire 18-year Broadway run (from 1982 to 2000), the Shubert Organization provided Inside Broadway with 50 free tickets to every Wednesday matinee. This upcoming season marks the 35th Anniversary of Inside Broadway and, coincidentally, the musical “Cats” has returned to Broadway at the Neil Simon Theater. It’s kismet! Katie McAlister, Inside Broadway’s program director, thought it would be appropriate to commemorate this auspicious occasion by using the musical as the theme for the 2016 session of Summer Stock Jr. 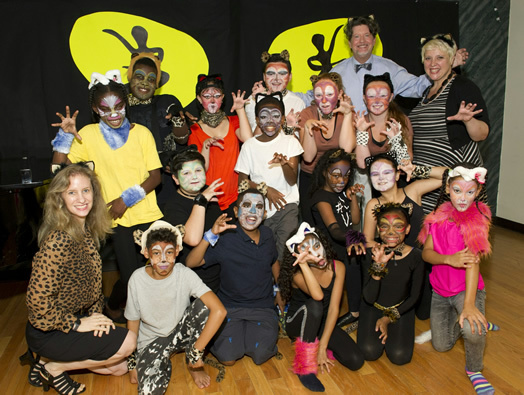 Teaching artists Abigail Jones-Brazille and Braddon Mehrten put their heads together and wrote, directed and choreographed “Jellicles on Parade, a Cats celebration!” for the campers. This engaging, original 45-minute show portrayed the T.S. Eliot characters from “Old Possum’s Book of Practical Cats” with cleverly integrated songs from the original show. Working diligently under the inspired tutelage of Jones-Brazille and Mehrten, the students learned most of the choreography and songs within the first week – quite a feat given the complexity of Andrew Lloyd Weber’s music combined with T.S. Eliot’s animated poetry. With the bulk of the show under their belt, there was time in the second week to refine characterization, intent, and vocal production. Practice makes purrfect! In addition to the rigorous rehearsal schedule, the campers were treated to a backstage tour of the Imperial Theater (just as the revival of “Les Miserables” was in its final days) hosted by house electrician Manny Diaz. They attended two Broadway matinees: “An American in Paris” and “The Curious Incident of the Dog in the Night-Time.” For many of these students, this was the first time they had experienced a full-blown Broadway production accompanied by a live orchestra. It was eye-opening. During the course of the camp, I was given the opportunity to discuss the importance of unionism in general and Local 802 specifically with the students. They listened attentively and asked some very good questions about what it means to join a union, the benefits we provide, and how integral the union is to working on Broadway. At the end of the two weeks, the final performance was held in the Club Room near the end of August. Introductions were made by Inside Broadway Executive Director Michael Presser and Local 802 Financial Vice President Tom Olcott as the excited audience of family and friends anxiously awaited the start of the show. As soon as opening number began, it was clear that all the hard work and practice had paid off. The “Jellicles” personified their characters with unabashed aplomb as Edwards accompanied these cool cats in song and dance. Two consecutive weeks of rehearsal made a big difference. The additional time and attention given to detail helped the show flow with a noticeably more polished look, down to the clever costumes and effective set. But more importantly, the extra time allowed the campers to truly bond and learn how to work together as an ensemble. Everyone involved had good reason to be proud of this summer’s production. Dog days indeed. To this reporter, the 2016 Summer Stock Jr. was simply the cat’s meow!